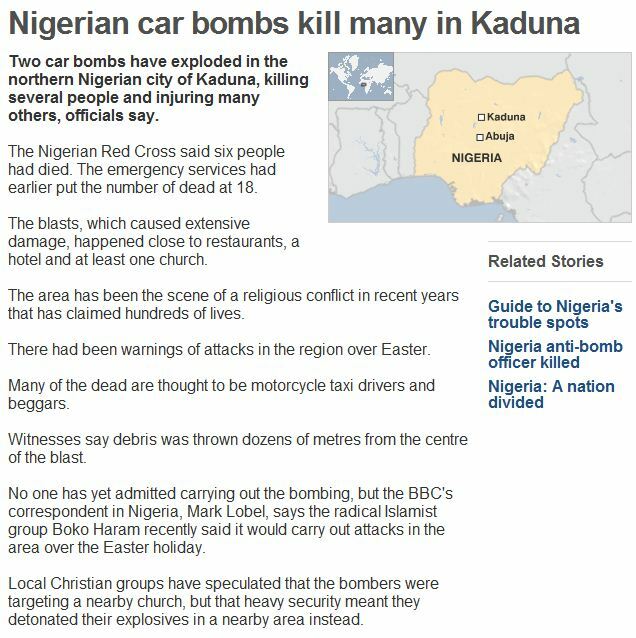 NIGERIA: BOKO HARAM SEND THEIR EASTER GREETINGS, 18 MURDERED IN CAR BLAST…….. – The Tundra Tabloids……. NIGERIA: BOKO HARAM SEND THEIR EASTER GREETINGS, 18 MURDERED IN CAR BLAST…….. Spreading all that mutual respect around. Previous Post Previous Post UK: QUEEN DOESN’T WANT TO BE RUDE TO RUTHLESS MURDERING LEADER OF BAHRAIN, INVITES HIM TO BANQUET SHINDIG ANYWAY……. Next Post Next Post EUROPE DEBT PROBLEM RIGHT BACK WHERE IT STARTED FROM……. Not “Nigerian” car bombs, ISLAMIC car bombs!